The chili paper is the fruit of plants that belong to the family genus capsicum which is members of the nightshade family, i.e.,.solanacea. In India Britain, Australia, Ireland, New Zealand, South Africa, Asian Pakistani and Asian countries it is commonly known as chilies. It is very good in eliminating harmful toxins from the human body and hence prevents from constipation they are usually A good and best source of dietary fiber which is good for proper movements of bowel system. 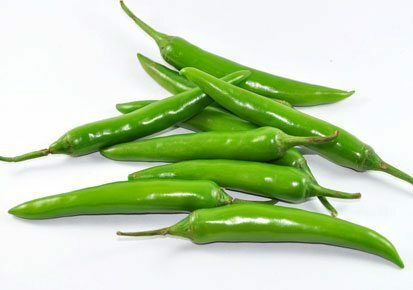 Green chilies have a considerable amount of vitamins C making them boost the immune system of the human body protecting it from different ailments it is definitely the good idea to replace red chilies with green chilies. It is very effective for the heart disorder it is good for lowering blood cholesterol triglyceride level.hence it is good in lowering risk of heart attack and stroke moreover it also prevents the deposits of fats in blood vessel walls which is caused by free radicals it is also good for lowering blood pressure heart rate consider eating green chilies which acts tonic for the heart. 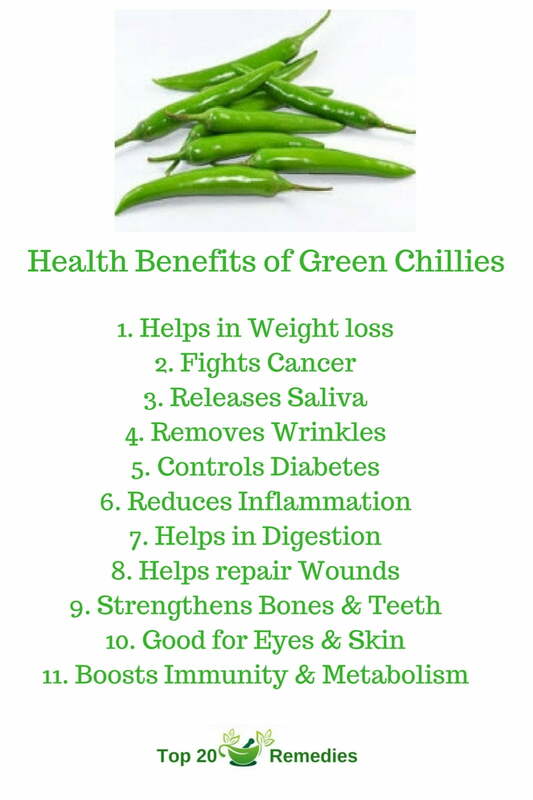 most of the studies say that green chilies act as mood stabilizers. capsaicin aids the release of endorphins (the feel-good hormone) into the brain which is beneficial in improving the mood. Foods that release saliva when you chew your food will help in proper digestion of the food if you add green chili it will release the saliva and it is thus mixed well while chewing the food this helps in good digestion process. It has many health benefits but it comes with few side effects if consumed in high quantities it can cause stomach and skin irritation regular high consumption of chilies may lead to piles disease.